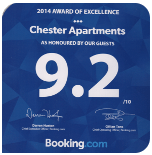 Chester Apartments are easily accessed on foot (a few hundred yards) from the railway station by heading down City Road towards ‘The Bars’ traffic island and turning into Seller Street then taking an immediate left turn into Bold Square. You will arrive at the property (on the right hand side). Chester Apartments can also be reached by car via the A5268, travelling clockwise along St Oswald’s Way towards ‘The Bars’ traffic island. mill Hotel on your left. Immediately before this island, take a left turn into Seller Street then an immediate left turn again into Bold Square. Travel to the end of the road whereby you will arrive at the property (on the right hand side). Please note that vehicular access is not possible directly from ‘The Bars’ island. Parking needs to be booked in advance.